Consists of 85 racks strategically located throughout the Laurel Highlands region, as well as several sites in Cambria & Indiana Counties. Locations include lodging properties, restaurants, & attractions. For more information, contact Louise Bates. If the brochures are to be hand delivered to our warehouse please place them in the large plastic container located on the left side of the building-ours is the first on the right. All brochures must be bundled in batches of 50. 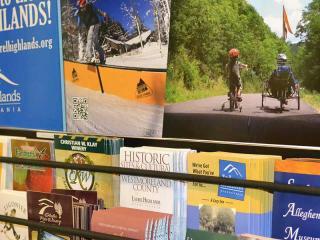 A $50 handling fee will be applied if brochures arrive for distribution and are not bundled. Your printer can bundle your brochures when you place an order for a nominal charge. Each case should be labeled with the name of the brochure and the quantity in each box and weigh no more than 35 pounds each. If the brochure you are shipping replaces an existing brochure, please notify us prior to the shipment. Any outdated materials are recycled. We will not return any old or outdated brochures.